RIDGID Porcelain Tile Diamond Blades have an ultra-thin alloy steel core that provides smooth cutting with minimum vibration. It is engineered with laser-cut seams that release stress to eliminate the risk of wobbling. The blade has a diamond-reinforced edge and is designed for fast, chip-free cutting of porcelain, ceramic, marble and granite tile. 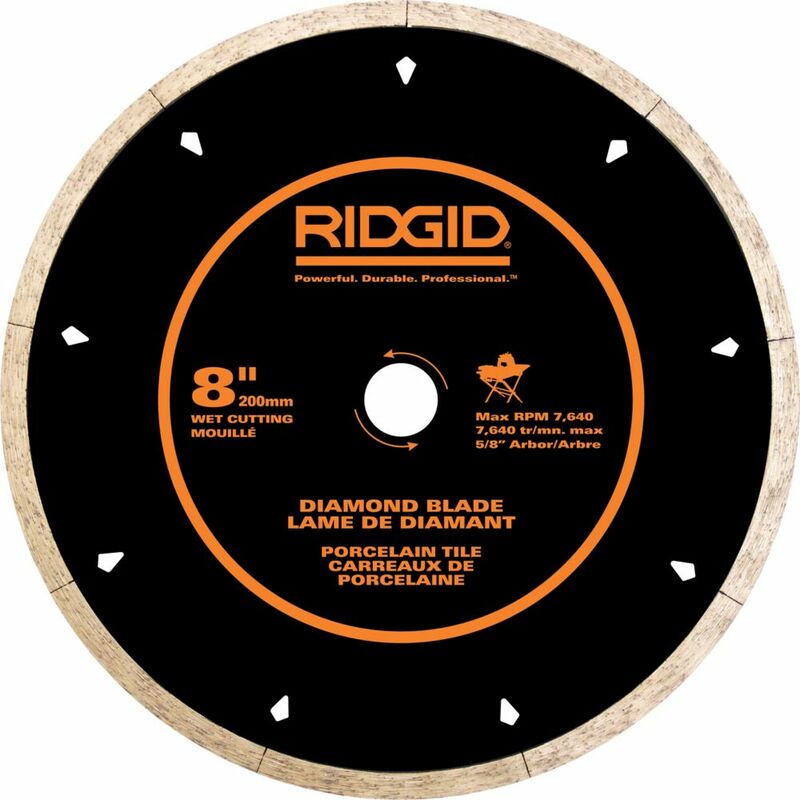 8 Inch Porcelain Diamond Blade RIDGID Porcelain Tile Diamond Blades have an ultra-thin alloy steel core that provides smooth cutting with minimum vibration. It is engineered with laser-cut seams that release stress to eliminate the risk of wobbling. The blade has a diamond-reinforced edge and is designed for fast, chip-free cutting of porcelain, ceramic, marble and granite tile. 8 Inch Porcelain Diamond Blade is rated 3.9 out of 5 by 8. Rated 4 out of 5 by TheFreezy2005 from Gets the Job Done This blade looks and feels much like the blade I took off to replace. I don't notice that the edge is any more "sharp" than the old blade. But then again, I have not gone through a ton of these either. This blade cuts well as my current project involves porcelain tile. I have to cut VERY slowly in order to get a straight cut. That could just be the nature of the material. The saw itself has lasted and doesn't seem to chip the porcelain too much on the back edge. It has lasted plenty of cuts so far as I picked up this blade halfway through a 4x5' shower tile in. Rated 5 out of 5 by RidgidMan from The best one I found so far That blade came with the Ridgid R4040 saw. I tried 4 differents other brand, much more expensive blades. None of them gave me the same cut quality and they didn't last as long as this one. Rated 5 out of 5 by AF from great wet saw blade I used the blade to install a marble back splash in our kitchen. The saw made fine as well as wide cuts. Performed well on miter cuts and still cuts like new. A bit pricey, $50, but is holding up well. Rated 1 out of 5 by Jacksonville from Bad blade Blade was bent when we installed on saw. Made saw have a bad vibration. Rated 5 out of 5 by davey from awesome blade this blade is one of the best that I've ever used. i'm full time flooring installer and tile specialist. I've used many blades in my carrear and this is one of the best. holds up good on long cuts and wears very well. I would recommend this blade. Rated 1 out of 5 by bobg from junk It's garbage. I could not make a cut cause the blade kept bending. Ended up putting the old blade back on the wet saw and eating the 50 bucks.